Radio Remote Controllers - Electric Vehicle Controllers Ltd.
Radio Remote Control of the locomotive is accomplished via a radio transmitter and receiver. 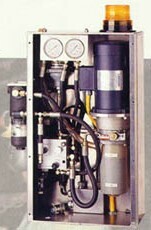 The operator uses the transmitter to control the locomotive from a position other than the cab of the locomotive. Electric Vehicle Controllers Ltd. has designed several different styles of remote systems. These products range from complex controls mounted in very robust enclosures to very simple units that work in conjunction with a specifically designed interface. The decision as to which remote unit to employ will depend on many factors, and will require further discussion once the decision has been made to radio remote a locomotive. Programmable Logic Controls (PLCs) form the base of our interface package which brings together the functions of the electronic controller, the radio remote package and the brake system. Models are available for single and dual motor locomotives that result in a practical and flexible system capable of accommodating the specific requirements of the individual end user. Wherever possible we employ "off the shelf technology" to keep down-time to an absolute minimum. Documentation in the form of schematics and manuals accompany each system. HYDRAULIC: Fail-safe brake systems of our own design complete with electric over hydraulic solenoid control. These units can be applied to locomotives with disc caliper brakes or in some cases be retrofitted to activate the wheel brakes found on some older style locomotives.